Today's subject is Easter. Specifically, Easter eggs. 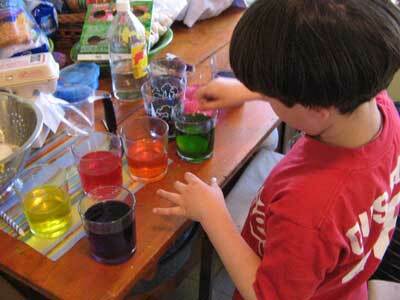 Specifically, dyeing Easter eggs. 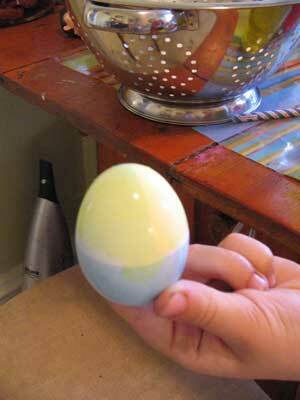 Specifically, what happens when knitters dye Easter eggs. But then, after all the eggs were dyed I was getting ready to clean up. I stared at all those glasses of dye and thought, Heyyyy........what if??????? The green yarn may possibly be the ugliest yarn ever made in the history of fiber and will probably get pitched as soon as it dries, but the pink-y yarn is actually quite pretty. It has some weird depth to the color that's pleasing. 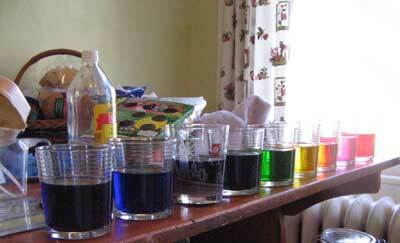 Gus had mixed a lot of the dyes together to make brown. This I threw on the yarn first, and then put the red on and then Cherry Kool-Aid. Tomorrow - stayed tuned for my NEW obsession!! What a good little egg that boy is! a new obsession? Now I'm obsessed with knowing. And I really like the pink. I might even grow to love the green and pink. I remember when that was the ragin' style, man. Two izods, worn at the same time, one green, one pink. CG - wa ha! good Easter pun!! SM - thank you for your kind comments, as always. 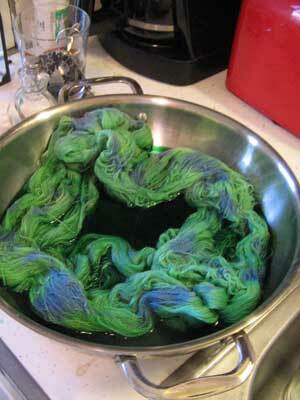 I thought using the egg dye was a pretty brilliant idea, until I saw that green yarn. Oof. is it time to start knitting ski masks for Giants and Phillies fans? 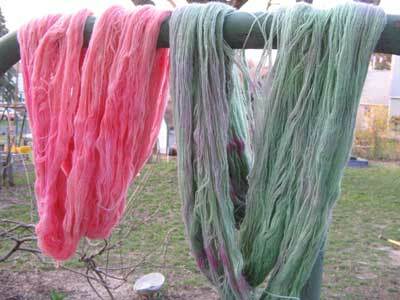 Don't pitch the "ugly" yarn - overdye it! 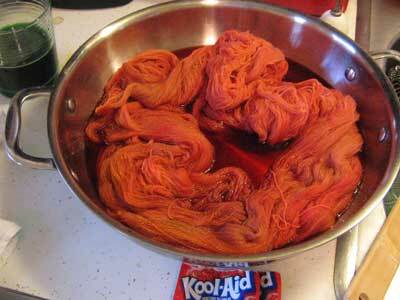 Whether its koolaid or more easter egg dye (on sale now since it is after easter) or food color/dyes or commercial acid dyes, you can dye over the yarn you're not happy with to get a better color. Obviously, light colors won't work well, but blues, purples, greens, grey, or brown would all dye over the color you don't like and, probably, produce something you like better. It's certainly worth a try before you toss the yarn. EPP - I feel your pain. I wish the Phils had been snowed out since Game 1.
kimd - overdyeing is a great idea! I think I might do that for the pink yarn, which I'd like to be a little more intense in color. The green yarn, alas, has already gone to my charity knitting source.